Albert van der Sel : Differential equations. In the series: Note 10. Subject: Differential equations Part 1. This note: Note 10: Differential equations Part 1. Please be sure that you are on a "level" at least equivalent to the contents up to, and including, note 9. Especially note 5 (How to differentiate and obtain the derivative function) should have been read first. For a substantial discussion of differential equations, we still miss some essential knowledge. This note will be a "gentle introduction", named "Part 1". Then, a few notes down the road (where a couple of more subjects will be presented), "Part 2" will follow. Chapter 1 describes "sort of", the general environment where "Differential equations" live and operate. too abstract and too formal, then you might be right. But even if you only get "half of it" (that is, of Chapter 1), then that's good enough for me ! but you only need to browse through it, and see if you can pick up the main line of reasoning. That is, it would be great if you can see how the differential equations can be obtained, and have a "feel"
If you follow my notes only to get a quick intro in math, then skip chapter 3. It's not neccessary to read it. Differential equations are used, and analyzed, in many disciplines, not only mathematics. You may think of for example, biology, meteorology, economics and many more. However, I think that in especially "physics" and "engineering", it may be regarded as a true fundament of most theories. Most will say that a differential equation is an equation of some function and it's derivatives. It may play part in some technical problem, and thus the equation must be solved, in order to find that function (or class of functions). then that's regarded as a differential equation too. With repect to the importance of the differential equation and it's solutions, maybe it's a little different a physics. Why? In essence, in physics, a "differential equation" describes the "dynamical state" of a physical system. We will see some examples shortly. That general "dynamical state", and the corresponding equation is often exactly what physicists look for. Once having the general equation, specific solutions can be found for specific situations (initial conditions). for a specific technical problem. The physicist likes to have a general description of a system, as fundamental as is possible. for just a certain system, under certain boundary conditions or initial conditions . For example, the four differential equations of Maxwell, fully describe the whole theory of classical electromagnetism. but the differential equations, although formulated in a very general way, can deliver the "solutions". Those four differential equations of Maxwell, are viewed as monumental in classical physics. I think it's informative, what others often say as to what (in general) a "differential equation" is. But, as we will see shortly, there is quite some variety in different types of differential equations. It's an equation with differentials like for example ∂ y / ∂x or ∂ f(x,t) / ∂t. Note: Often the differentials "dy" and "dx" are used if the function y=f(x) is dependent on one variable (x) only. A notation like " ∂ f / ∂x" is often used when the function f(x,y,...) is dependent on more than one variable. on that particular variable (like x in ∂ f / ∂x".) However, that rule is not strickt, and I will use both notations. If (1) is true, we already have seen quite a few of them, for example in note 5 and 8. Such an equation can be solved by finding the primitive function, like the primitive of 2x in my example. If you go through Highschool textbooks, you will see numerous examples of such kind. Ofcourse, in the two examples above, you can replace ∂ y / ∂ x with ∂ f(x) / ∂ x (remember, y=f(x)). A differential equation is an equation involving an unknown function and (one or more of) its derivatives. Note that this is a very common statement as well. For example y" + 6 y' - y = 0 then is a differential equation. The example equation here is the same as f "(x) + 6 f '(x) -f(x) =0, since, as always, "y=f(x)". where determining coefficients are eliminated. We will see that in section 1.3. These coefficients determine certain classes of functions, and thus the differential equation would not be a "general" equation. derivative(s) of a function to an expression with variables in common. However, most will regard (1) through (4) as valid descriptions of differential equations. Up to now, we have studied function and relations using one variable, like f(x), where "x" is the variable, y=f(x) depends on. It's (up to now), indeed so, that my notes resemble "standard Highschool math" a bit. The next note will address functions like f(x,y) or f(x,y,z). Thus functions having more than one variable. There is actually not so much different here, as we will see (in note 11). We already have seen lot's of those functions, for example f(x)=3x2-3, or f(x)= -5 ex. The function "f(x)" is dependent on one variable only. just as was the case with f(x). By the way: "scalar" is just another word for "number". in most occasions other letters or symbols are used. And most often, those sysmbols reflect the physical reality. For example: a particle, initially at rest, then undergoes an acceleration. Clearly, the distance covered, depends on time. In such cases, physicists create formula's and plots, using for example "s" as a measure of the distance, and "t" to reflect time. view as equal to the parabola y=ax2 (as of x>0). ∂ φ(x,y,z) / ∂ y, or, as another example, something like ∂ f(x,t)/∂ t.
∂ f(x) / ∂x, or ∂2 f(x) / ∂ x2, or ∂ f(x,t) / ∂t, or ∂ φ(x,y,z) / ∂x. coefficients are removed. The following example will make that clear. Upper result is what mathematicians formally call a "differential equation". It is no more than a result by using both equations (1) and (2), and eliminating "p". But indeed, it looks a bit different. There is an amazing thing here. Note that there is no "p" in equation 1. At any point, we can find the gradient of the tangent line, just by filling in "x" and "y"
So, if we consider the point (1,2), then the gradient is 4. Amazingly, we do not even have to know the "p" of y=f(x)=px2. Do you see that? We simply get the gradient, at any random point, from equation 2 (!) That's pretty "wide". You now that "p" determines the shape of the parabola. Just visualize, for example, y=2x2, or y=1/2 x2, or y=-3x2 etc.. Indeed. The equation y=f(x)=px2 defines all possible parabola with it's nose at the Origin (0,0). with it's nose at the Origin (0,0). If you take a specific "p", then you find a specific solution. But our differential equation, just simply gives the gradient, for all cases of y=f(x)=px2. Relax, we will not play it that hard. We will never "demand" a very specific format, as you will see in the rest of this note. It's in a general format, and not just a equation for a very specific solution. in whatever format (like factors with x and y) both not with a defining paramater for a single solution. Section 1.5 is "Optional reading", but recommended ! It may "look" difficult, but it isn't. If you do NOT like this section, then just skip it. It's not essential for the rest of this note. No, you do not need to remeber this one. But it's a famous differential equation from the early period of the development of Quantum Mechanics. Ψ (r,t) represents a Quantum system like a particle, usually thought to have wave-like properties as well. Ψ is dependent on the position in Space (r), and is also time-dependent (t). the distribution of the wave "in space" due to ∇2, which is a sum of spatial differential operators ∂2/∂x2, ∂2/∂y2, and ∂2/∂z2. As time progresses, the distribution of Ψ (r,t) changes over all points r=(x,y,z), in a dynamical system (a Potential, or Force field is present). The "i", the "-iħ", and the "μ", are constants, and not some defining parameters (like "p" was above). relates a differential of Ψ on t, to a differential of Ψ on spatial coordinates (in this case only "x"). These are really different sort of coordinates. So, it's not an equation of 'x' or ∂ / ∂x only. and I hope you agree on that. These equations contain differentials like ∂ / ∂x, but no higher order differentials like ∂2 / ∂x2. You may also say that these equations only use first derivatives, but no higher derivatives. These equations contain at least one differential ∂2 / ∂x2 and no higher order differential. You may also say that these equations use at least one second derivative, but no higher derivatives. only contains differentials on x (like ∂ / ∂x, or ∂2 / ∂x2). This applies to ordinary- and partial differential equations. Let's focus on ordinary ones only (since that is the most easy one). any sum of such functions. Almost all differential equations you will see (here, and elsewhere) are linear differential equations. Note the similarity with the derivative of a sum of functions in note 5. Next, let's turn our attention to some examples. 2.1 Example 1: Using the technique of "seperating variables"
since f(x) depends on one variable only. If neccessary: check section 1.6 again. and having the x expression and dx on the other side of the "=" symbol. yes! We managed to get all y, dy on one side, and the x and dx to the other side. Now, we can integrate both sides, and that will deliver (in principle) the solution. In fact, it now boils down that we are able to find the primitive of both sides. The theory of integrating and obtaining primitives, was the subject of note 8.
and extend note 8 a bit. All in all, if you have followed the "reasoning" here, I am quite happy with that. For now, for me it's all about the principle on how to handle stuff. 2.2 Example 2: Harmonic oscillator, with-, and without damping. In section 1.2, we have seen several descriptions of differential equations. in a general format. That would be rather cool. Figure 1. Simple Harmonic oscillator, with-, and without damping. In figure 1, we see a harmonic oscillator, but this time, it's a mass "m" attached to a spring. In example 3, we will see another example, namely the Pendulum, but fundamentally, that is quite th same principle. or similar device, will "work against" any change in position. In most approximations, the magnitude of the damping is linear with the speed of the mass. the more "drag" you wil feel. the horizontal axis (the x-axis) is neglectable. The right side represents a damped ocillator, where a device like a piston, provides a drag against motion. See the left side of figure 2. Suppose, when the spring is in "rest" (equilibrium), the postion of the mass "m" is at x=0. and back again, and repeats the motion with a certain fixed periodicy (or frequency). of the sin() and cos() functions in note 4). of the extension of the spring (if it's not too large), which is the same as the displacement of "m"
where "k" is some constant, depending on the type of spring. the direction of Fr is negative. I agree that if you were not familiar with F=ma, then the example is somewhat more difficult to grasp. and the universal relation is "F=ma". This is exactly the "form" of a differential equation we were looking for. Now what about solutions for the Harmonic (undamped) oscillator? to the solution of the differential equation we have seen above (equations 6, 7 and 8 are the same). see a cos(t) or sin(t) function, just depending on when you start to record the graph. If needed, revisit note 4 again. Where "a" is a constant, representing the maximum displacement of the mass "m", when cos(ω t)=1. Also, ω=√(k/m), and represents the frequency of the periodic motion of this undamped system. It should not surprise you, that the periodicy (T), or frequency, is determined by "k" and "m". how much work must be spend to set "m" in motion anyway. it really is a solution for the equation. Equation 9 is fully correct, if we displace the spring to the right, and then let go. That exact point, where I am about to let go, that will define the max displacement, or indeed, "a". 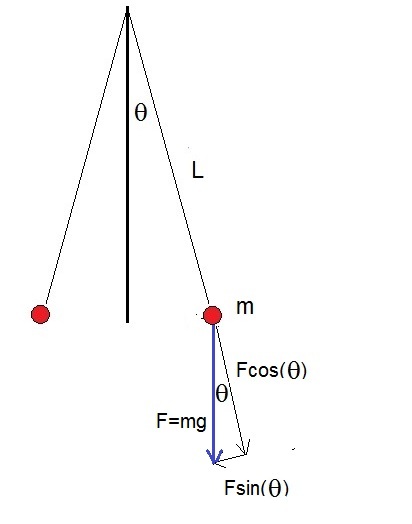 the motion of mass "m". True, that will be an exact cos(t) function, multiplied by "a". Since physicists are slick people, they favour ofcourse the most simple and elegant solutions. the position of mass "m" at some moment t=t1. like a piston, that actually is our damping system. will display a damping effect which is dependend on the "speed" of the object. so is the damping effect. Where "c" is some constant depending on the damping system itself. Now what about solutions for the "damped" Harmonic oscillator? Do you remember note 7 where we discussed the ex and ln(x) functions? If not, maybe you want to revisit note 7 again. Now, the constants like "c" and "k" define the motion of mass "m" too, just like the value of "m" itself. It seems therefore reasonable that the solution must have c, k, and m "somewhere" in the formula. From note 3, we know how to solve quadratic equations, so from equation 16, you are able to find μ yourself. Equation 15, is a mathematical solution, which "fits" in the differential equation. Then I really want the "damped solution" to look like the "undamped one", since the damped one might only slowly "die out"
will differ, since a piston (or similar device) will impact the frequency ω considerably. that it really is a general solution to the damped mass-spring system. whose amplitude decays exponentially in time due to the e μ t factor. 2.3 Example 3: Another Harmonic oscillator: the Pendulum. Let's consider the motion of a pendulum. Actually, it's not really fundamentally different from the examples in section 2.2. But it can be nice just to see another physical system, for which the same reasoning applies. is relatively small. Please take a look at figure 2.
between the rope and the fixed vertical axis. maximum displacement on the left again), takes "T" seconds. Figure 2. A simple pendulum, where the maximum amplitude us relatively small. or "Force" is equal to "mass x acceleration". Then, that Force is resolved in two components. where "m" is the mass of the ball, and "g" is the "acceleration of Gravity". I must admit that if you did not know that formula, then what follows is not so trivial anymore. something like y" + 6 y' - y = 0. That's all really. So, the physics plays a secondary role here. can be disolved in component vectors, which, when "added", returns the original vector again. Note that mgsin(θ) is the source of the motion of the mass "m". Note that for a small θ, we have sin(θ)=θ. Now, the following is a bit of physics, I am afraid, but I am going to rewrite the equation above in angular acceleration. the orbital speed is low, and so is the change of θ. So, the orbital speed (or better: tangential velocity), and the "angular velocity" are linearly related. Note: actually, the relation is "vt = ω L", where ω=d θ / dt. is linearly related to vorbital. In fact it is vt / L.
So, again, in equation 19 we have found a differential equation in the desired format. 2.4 Example 4: Again the damped mass on a spring: the characteristic equation. In this case, it's simply a quadratic equation which can be easily solved in order to find μ. This specific method of helping to solve differential equations is called using the characteristic equation. Chapter 3. A "two degrees of freedom" system. This chapter is optional reading. Consider the setup as is shown in figure 3. Figure 3. Two degrees of freedom, due to the fact we have x1(t) and x2(t). three pistons, again, each with it's own damping constant "c". like to describe complex systems using vectors and matrices. That's really great, as you will see shortly. you will already see some application here. Let's first try to write down the equations of motion for x1(t) and x2(t). However, you must have read example 2 above, otherwise I am afraid that this section is pure "abracadabra". For simplicity, I will start with a system with springs only, and thus first omitting the damping factors (no pistons). all forces operating on m1 and m2 (just as we did in example 2). there is nothing fundamentally different here. It's a large puzzle, but if we write it all out, we get the following equations. Just consider Newton's law on the displacement x1, and next on x2. Note the " and ' symbols, in order to denote that we are actually dealing with d2x(t)/dt2 and dx(t)/dt. Now, we have x1(t) and x2(t), which define the position of the two masses at any time "t". are solutions for the differential equations 21 and 22. Those solutions will probably not so "easy" as we saw in section 2.2.1. like e.g. x1(t) = a cos(ωt + θ) as we saw in eqution 11. However, many physicist will first try to "ease" the notation of equations 21 and 22 somewhat. For that, they use "vectors", "matrices", and "determinants". Take a look at this example: A point in the XY-plane, maybe pinpointed by stating the "point" (x,y). For specific values of "x" and "y", you indeed get a unique "point" in the plane. represent the "point" (x,y) also as "(x,y) = x (1,0) + y (0,1)". A few examples of vectors can be seen in figure 4 below. Figure 4. A few examples of vectors in R2 and R3. where x1(t) plays a similar role as "x", and similar for x2(t) and "y". How does this relate to equations 21 and 22? Well, you can dividee both sides of these equations by "m1" and "m2"
The part between the "[ ]" is called a "Matrix", and in general defines an operation between vectors. In a very compact notation, we may write equations 21 and 22 as: x" = A x, where "A" represents the matrix. That compact notation written in full, is displayed in figure 5. The next note is a super quick intro in functions having more than one variable.